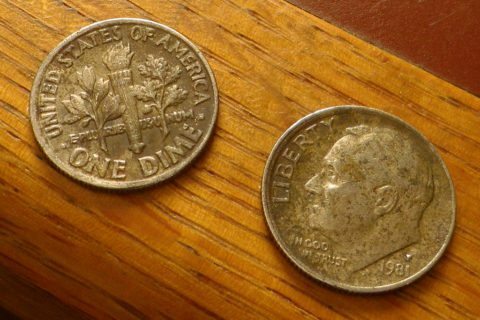 Tips For Collecting Roosevelt Dimes: Easy To Find In Circulation & Valuable Too! Collecting Roosevelt dimes can be both fun and challenging. After all, while Roosevelt dimes flood our pocket change, it can be a bit costly for some to buy and assemble a collection of the silver Roosevelt dime. Roosevelt dimes were first made in 1946. In 1965, the United States Mint began striking copper-nickel clad Roosevelt dimes. So, you still think the Roosevelt dime series is boring? I didn’t think so! Here’s a list of current Roosevelt dime values. Roosevelt dimes are pretty easy to find in circulation. As its goes with most areas of coin collecting, the biggest challenges come in finding certain dates. 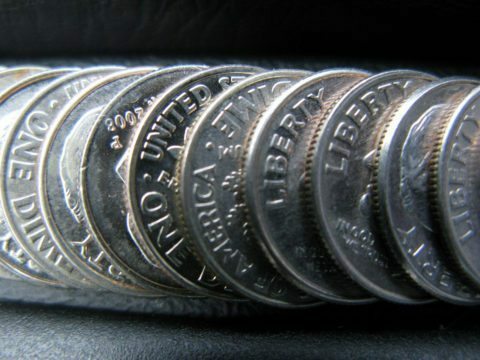 For example, all Roosevelt dimes made before 1965 are made from a composition consisting of 90% silver. Virtually all of these coins were removed from circulation by silver hoarders by the end of the 1960s and are very difficult to find today. Having said that, silver Roosevelt dimes still do turn up on occasion. So it’s worth checking your change and especially searching rolls of dimes to look for these old silver coins. A few years back, it was relatively easy to pick through bank rolls of dimes ($5 each, or 50 coins) and boxes of dimes ($250 worth, or 2,500) and find at least 1 or 2 silver dimes. These days, so many silver stackers are looking for silver and are in on this silver coin searching game that it’s becoming more difficult to find silver coins from local banks — but you can still find silver dimes in circulation if you’re persistent. At this point, the Roosevelt dime is not as widely collected as, say, Lincoln cents, are. Therefore, many of the semi-key dates are in good supply at many coin shops. Sometimes they’re even sold at discount rates simply to move the inventory out of the store. Clad Roosevelt dimes are, as might be expected, easy to find in circulation. Of course, these coins are worn and may not be satisfactory to coin collectors who want gem-quality coinage. For those uncirculated Roosevelt dimes, a stop by the local coin dealer will again be necessary. Most clad Roosevelt dime dates can be bought for as little as 30 to 50 cents each. Proofs and error Roosevelt dimes can be bought from your local coin dealer, too — but don’t forget to check your change for those error coins! For example, the 1982 no-P Roosevelt dime can be located in circulation and many people wind up with this exciting clad coin error simply by picking it up in pocket change for face value. The 1982 no-P dime is worth about $75 in worn condition. If you closely scrutinize every Roosevelt dime that passes through your hands, you many find other varieties — such as doubled dies, repunched mintmarks, and other exciting error coins!